First-year graduate student Jacob Kuban, third from left, with the other Mr. Agriculture contestants. In a lot of ways, the pageant that Jacob Kuban ’12 won last week was like any other. There was a dance number, a quick Q-and-A with each contestant, and then everybody showed off their evening wear. But when it came to the talent portion, Kuban brought out the big guns. He showed off how to make a terrarium—a small, clear container in which to grow plants—and the audience ate it up. With that, Kuban became Illinois State’s first-ever Mr. Agriculture. Along with eternal glory, the first-year agriscience graduate student won a philanthropic prize for his sponsor, the agriculture sorority Sigma Alpha. 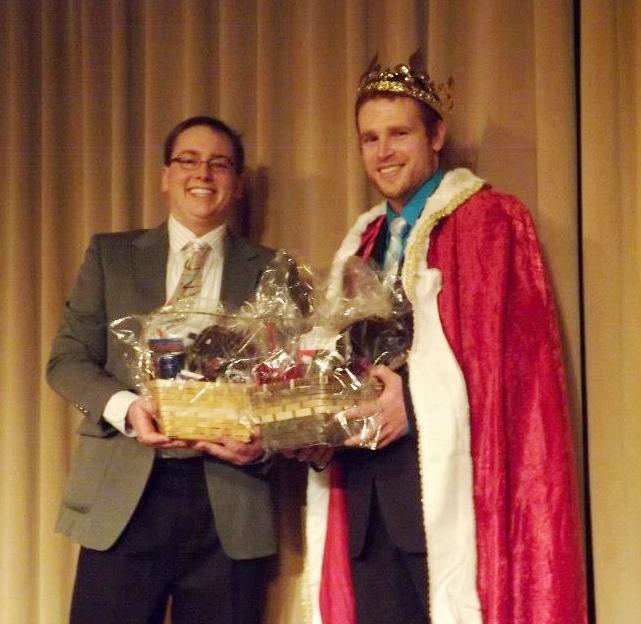 The Mr. Agriculture pageant itself, held on March 20, raised more than $400 to help support another student organization, Alpha Zeta, and its upcoming trip to a national leadership convention. “Hopefully it’ll grow and more people will want to do it,” Kuban said. Jacob Kuban, the winner of the Mr. Agriculture pageant, and People’s Choice winner Jeff Svendsen. The event was conceived as a way to raise money for both the winning group’s philanthropic cause and the Alpha Zeta agricultural honors fraternity’s convention trip, said co-organizer Cara Workman. Kuban entered after being cornered in the Department secretary’s office by a bunch of Sigma Alpha students. The pageant was a well-oiled machine, he said, down to a choreographed Mr. Agriculture musical number featuring an eclectic mix of Shania Twain, T-Pain, and Luke Bryan. Kuban’s been interested in the world of plants since childhood, growing up in a wooded area in northwestern Illinois and helping his father tend to the family’s small vegetable garden. “When I got a little older, I thought I was really cool, and I transplanted some trees from the woods to my parents’ yard,” Kuban recalls with a laugh. After his high school agriculture teacher showed him how horticulture could be his career, Kuban got his bachelor’s degree at Illinois State, in horticulture and landscape management, then stayed for graduate school. He’d like to work at a golf course after school, and then maybe run his own nursery. And now, he can add Mr. Agriculture to his resume. He also got a gift basket, a dinner with the Department of Agriculture chair, and a donation for Sigma Alpha’s philanthropy, Illinois Agriculture in the Classroom.